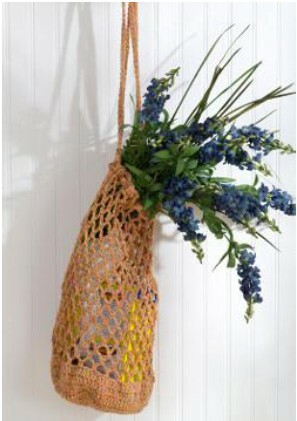 Crochet an eco-friendly bag to carry fresh produce from the farmer’s market, daily essentials or to tote your refillable water bottle, to avoid buying plastic bottles. This is a quick and easy bag crochet pattern in eco-friendly cotton yarn. Gauge: Rounds 1-5 of Base = 6½”. POUCH Round 1: Make a slip knot, working around elastic band, work 48 sc around band, slip st to first st in join – 48 sts. Round 2: Ch 3, dc in each st around, slip st in first st to join – 48 sts. Round 3: Ch 3, 2 dc in next st, *dc in next st, 2 dc in next st; repeat from * around, slip st to first st in join – 72 sts. Round 4: Ch 3, dc in next st, 2 dc in next st, *dc in next 2 sts, 2 dc in next st; repeat from * around, slip st in first st to join – 96 sts. Fasten off. BASE Ch 8, slip st in first st to form a ring. Round 1: Ch 3 (counts as dc here and throughout), 23 dc in ring, slip st in first st to join – 24 sts. Round 2: Ch 3, dc in same space, [2 dc in each st] around, slip st in first st to join – 48 sts. Round 3: Ch 3, dc in each st around, slip st in first st to join. Round 4: Ch 3, 2 dc in next st, *dc in next st, 2 dc in next st; repeat from * around, slip st in first st to join – 72 sts. Round 5: Ch 3, dc in next st, 2 dc in next st, *dc in next 2 sts, 2 dc in next st; repeat from * around, slip st in first st to join – 96 sts. Round 6: With right sides together, join Base and Pouch, matching sts and working through both thicknesses, ch 1, sc in each st around, slip st in first st to join – 96 sts. Rounds 7-9: Ch 3, dc in each st around, slip st in first st to join – 96 sts. Round 10: Ch 1, sc in same st at joining, *ch 5, skip next 3 sts, sc in next st; repeat from * around to last 3 sts, ch 2, dc in first sc forming last loop – 24 loops. Rounds 11-25: Ch 1, sc in loop just formed, *ch 5, sc in next loop; repeat from * around to last loop, ch 2, dc in first sc to form last loop. Round 26: Ch 1, 3 sc in loop just formed, 5 sc in each loop around to first loop, 2 sc in loop, slip st in first st to join. Fasten off. FINISHIING Strap Ch 201, sc in 2nd ch from hook and in each ch across. Fasten off. Weave through loops of Round 25. Sew ends together. Weave in ends. Fold Bag inside Pouch.